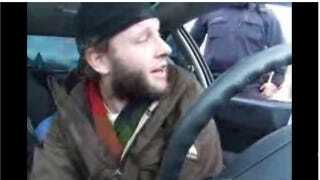 Canada's stereotype as an easygoing land will only be re-enforced by these videos showing a stoner giving a 15-minute lecture to a police officer that dared pull him over. It's like a PSA for Tasers. It's not clear where or when these videos were taken, or how they came to be released since they were shot by the driver of the car. But it's obvious the driver belongs to one of the "sovereign citizen" movements that questions the validity of every official piece of government paperwork. Openly smoking a hand-rolled cigarette only adds to the environment of mirthless inquiry. Click to viewPolice officers commenting on BluTube have amazed at the patience of the officer, and noted that had this taken place in U.S. soil the driver would be "eating road gravel." Several also made it through to the end to hear the driver's female companion say "I tried to hide the..." See if you can spot the stash. Warning: The contents of these two videos consist mostly of nearly unintelligible jibber-jabber that would get tiresome in an Evergreen State dorm room bull session. This language could cause ear bleeds and temporary paralysis from its sheer "joindering." Proceed with caution.